An online browser MMO game by Polish studio Bloomga S.A. The game allows you to develop your own insular kingdom in a world, where things happen even when you're logged out. Islandoom is a browser-based MMO strategy game that uses a free-to-play model with optional premium micropayments. Players take control of island empires and compete with each other in terms of economic and military development, often attacking each other to obtain valuable raw materials. Polish company Bloomga S.A. is responsible for creating the game. The game is set in a world where climate change and conflict with weapons of mass destruction have led to the annihilation of most of the continents. The only remaining stretches of land are small islands, over which control is given to ambitious captains. Marine commanders exercise total power over their small empires, controlling the development of infrastructure and selecting targets for looting expeditions. The nature of their fleet and their economic background depends on the faction they represent. In the world of Iceland there are four sides: Divitos, aggressive Furium, Armun's defensive focus and Medius' preference for sustainable development. The essence of gameplay in Iceland is the constant development of the power of the island empire. This task is achieved primarily through the development of land-based economic and shipbuilding infrastructure and the production of combat vessels that can attack other players' islands. An important feature of the game is the fact that it takes place even when the player logs out and leaves the computer. While the user is at school or at work, shopping or at the cinema, the fleets sent to the destination, the installations are expanded, the shipyards produce ships and the mines extract raw materials. This makes our island a target of a loot attack at any time, led out by a gracious player on our resources. Raw materials are the key to the development of the empire. Thanks to them we can expand the infrastructure of the island, as well as produce and supply ships. The main raw materials are quartz, steel, polymers and uranium. The main source of their acquisition are the mining buildings on our island, but we can also steal them from other players through attacks and gain peacefully through trade. In addition, the blocks of flats built on our island provide the workers necessary for the functioning of all aspects of the empire. Shipbuilding allows us to launch ships and submarines for various purposes: offensive, defensive as well as special, e.g. spy ships. Each model is characterized by specific combat efficiency, speed, payload, fuel consumption, etc. The availability of certain units depends on which faction the player has chosen at the beginning of the game. In addition to ships, we can also produce defensive structures on the island to protect the safety of our valuable raw materials. As our empire grows, our empire moves up to the next level, which gives us the opportunity to choose from a variety of bonuses, e.g. in terms of economic efficiency. To the next levels we can also advance our character, moving around the game world on board a special ship. This flag can be upgraded with components increasing its statistics. Experienced commanders of powerful empires may try to fulfill the overriding goal set by the creators. It is about breaking through archipelagos of islands controlled by artificial intelligence and conquering a fortress located in the very centre of the game world. The social character of the game manifests itself in the possibility to form an alliance, which allows for close cooperation between allied players. Members of the alliance can, among other things, develop a special common island. 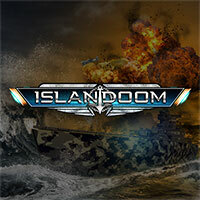 Islandoom is a multiplayer MMO. After creating an account we can choose a world where we will have the opportunity to meet many other players, fight with them, talk and enter into alliances. The player's island is presented in the form of a sliding 2D scene, which contains (in some cases animated) images of the buildings owned. The map of the world is also two-dimensional and shows the locations (islands or open sea zones) as large grid fields - chessboard, where each field has its x and y coordinates. Game score 7.3 / 10 calculated out of 368 players' votes.